Aliveness: eligibility to hit another ball with your ball to earn bonus strokes; i.e., if Blue is alive on Red, that means that the Blue ball may legally strike the Red and gain two bonus strokes as a result. 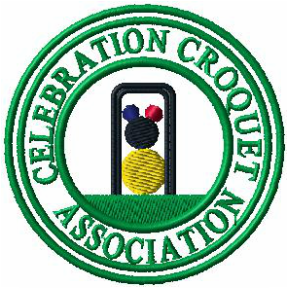 American Rules Croquet: the form of 6-wicket croquet most commonly played at USCA clubs in North America. Ball-in-Hand: a ball that needs to be repositioned on the court, usually in relation to another ball which it has roqueted, but also to be placed on the boundary margin after going out of bounds. Boundary Margin: the imaginary line inside the designated boundary, where balls are placed after going out of bounds — usually either one mallet head's length or one mallet length from the boundary line. Break: scoring more than one wicket in a single turn, i.e., a "three wicket break" or an "all-round break" (scoring all the wickets in one turn)--the ultimate achievement in American Rules croquet. Clearing Deadness: the restoration of eligibility to hit other balls for bonus strokes which is achieved when a ball goes through its proper wicket. Roquet: a stroke in which the striker's ball hits another ball upon which it is entitled to take bonus strokes. Rush Shot: a roquet that sends the ball a significant distance in the targeted direction of play. Wickets: the metal or wire openings set in the lawn through which points are made, also called "hoops".